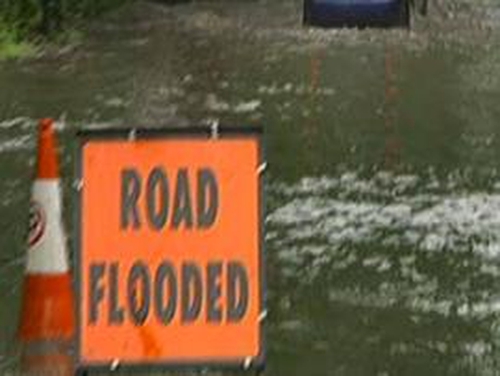 Gardaí and the AA have warned motorists that after torrential rainfall, flash floods have occurred in many areas. The rain over the last 24 hours in Dublin came close to breaking the record for a single 24-hour period in August. Dublin Airport got 56mm of rain in 24 hours. The record is held by August 1986, when there was 60mm, caused by Hurricane Charlie. In Co Kildare there is flooding around Celbridge town with many roads impassable. There is also some flooding between Naas and Blessington. In Co Laois a river has burst its banks along the Ballyroan to Portlaoise Road at Cashel Cross. One lane is open to traffic. The Portlaoise to Timahoe road is also badly flooded and the road between Stradbally Village and Athy is impassable. The N3 is closed inbound and outbound at Blanchardstown Shopping Centre. The M1 is closed inbound and outbound after the Port Tunnel. The M50 is blocked at Ballymun northbound. Diversions are in place in all of these areas. On the trains northbound and southbound Dart services are suspended between Malahide and Howth junctions and there is significant disruption to Northern Commuter and Belfast rail services. Garda diversions are currently in place and long delays are to be expected. Dublin Airport has urged passengers to give themselves plenty of time to get to the airport, and if possible to check their route before they leave. The football match between Shamrock Rovers and Sunderland which was due to be played in Tolka Park at 7.30pm has been cancelled due to the flooding.